Below are set out the dates and fees for our 2019 revision courses for the Foundation Certificate exams. Course fees include, as well as tuition and course materials, overnight accommodation at the venue during the individual course, meals (lunch, dinner and breakfast) and use of the leisure facilities at the Training Centre. The table below sets out our courses for the Foundation Certificate papers. Course descriptions, which set out the content and approach of each course and include suggestions on pre-course reading, can be read or downloaded by clicking on the course name. Each 1.8 day and 2 day Foundation course includes one night of accommodation during the course, with lunch, dinner and breakfast. If accommodation, with dinner and breakfast, is not required, the fee will be reduced by £95+VAT for the relevant course. If you want this option, please advise at the time of booking. For those attending 19/D FC4 and 19/B FC2, and/or 19/C FC3 and 19/A FC1 and/or 19/A FC1 and 19/E FC5 accommodation and meals (i.e. dinner & breakfast) are provided between courses at the special rate of £70+VAT each night. If accommodation is needed before a (non-consecutive) course, the cost if £70+VAT for accommodation and breakfast or £95+VAT for dinner, accommodation and breakfast. We offer a 5% discount for booking of five or more places by a firm. 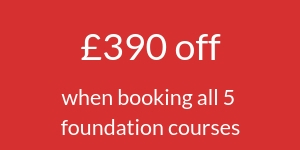 Where all five foundation courses are booked this discount is replaced by a larger saving, with the cost for all five courses reduced to £3,500+VAT, representing a saving of £390+VAT as this includes the accommodation between courses on 27 June and 2 and 4 July.